This is a small waterfall located near the Rathnapura town. 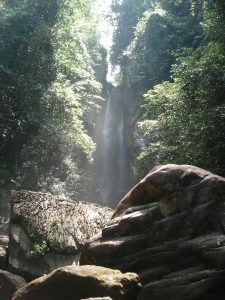 To reach the waterfall you have to travel few kilometers towards Balangoda from Rathnapura until reach to Weralupa Junction. You have to turn to the small road from there and travel about 2 km where you meet a small bridge. From there turn to the small path and walk until you meet the water stream called Katugas Dola. From there, you need to walk over that water stream until you reach the thin 6m height Katugas Ella. It may be difficulty to reach this location for an elderly person sine it is required to walk with the water stream of Katugas Dola over the slippery rocks. Katugas Dola is a small water stream which will meet the Kalu Ganga at the Rathnapura area.